This week, the lovely Clara @ Southern Thintellect nominated me for the Liebster Award! I had never heard of it but quickly figured it out, thanks to Google. The goal of the Liebster award is to give visibility to smaller blogs, which is awesome! There is a list of requirements for the nominees (listed at the end of my post) and I figured all my random facts and questions would be linked to food, to follow the theme of my blog. I am obsessed with the movie “Willy Wonka and the Chocolate Factory” (original). Possibly because I spent a lot of my childhood imagining a world made of chocolate, people included. I also wouldn’t mind living with the singing Oompa Loompas. Growing up, my mom would call broccoli “summer trees” and cauliflower “winter trees” to convince us to eat them. I still differentiate them that way on occasion. My husband often says that my blood must be mostly maple syrup since I like to put it on everything. I still don’t understand why Americans put butter on pancakes. Smarties are infinitely better than M&M’s. Trust me on that one. I hate grape flavor candy. Every year for my birthday, my mom used to bake me a chocolate cake with cream cheese frosting (with almond extract instead of vanilla…so addictive!). One year, I asked her to make me a cake made entirely of frosting. She refused but I still hope to try it one day. I have this weird childhood memory of my brother and I both getting time-outs (in our separate bedrooms), and him sneaking into my room with a bucket of leftover fried chicken. No one remembers it, and my mom doesn’t even think she ever bought us fried chicken but somehow I still have this oddly vivid memory…or was it a really weird and realistic dream? 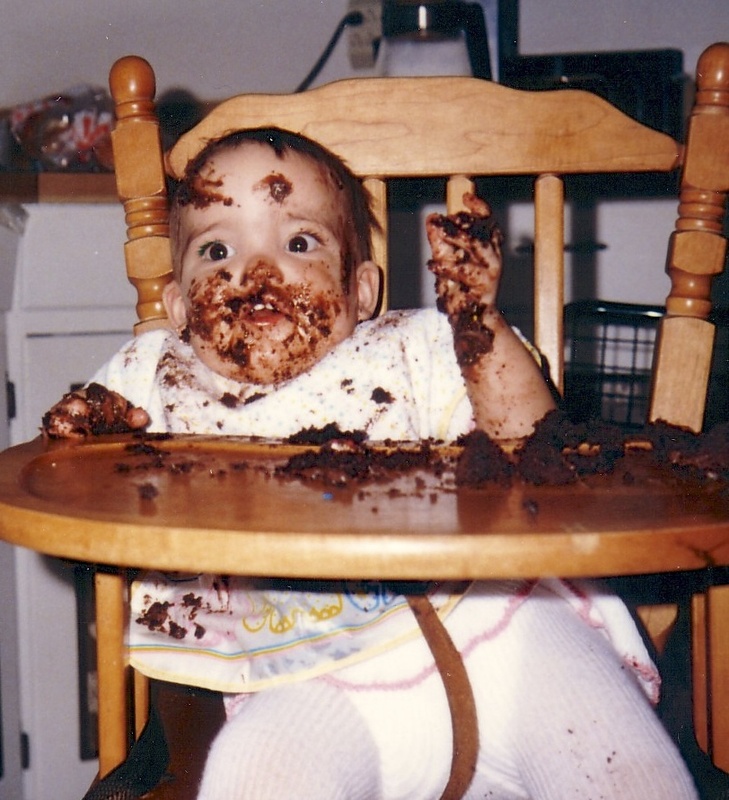 On my first birthday, everyone expected me to destroy the cake. I apparently was too clean so my godfather and my grandpa decided to smear the cake all over my head to get the typical first birthday messy photo. I can’t handle spicy food at all. If you think it’s easily tolerable, my mouth will probably be on fire. I usually ask my husband to test the food first although I really do try more now, even when it hurts! Every time I go back to Quebec, my first meal in the province has to be a poutine. It’s the best welcome-back meal. Do you prefer morning, afternoon or evening workouts? Morning workouts are my favorite. It just feels like a good way to start the day and incite me to think in a healthy manner all day long. Who would play you in a movie? I used to be obsessed with Katie Holmes (in her Dawson’s Creek days, high school years for me) so she really is the only one I can think of. What’s a food you have never tried, but would like to? Escargots. My parents used to eat them when I was growing up and I would refuse to go near it. Now that I live somewhere where they aren’t as common, I just hope to get a chance to try them at some point. Are you a hat person? Not really. I love caps but since my hair is shorter now, it tends to look silly. So I still have favorite hats but I don’t wear them much. I do like winter hats though! Especially my monkey ears one. How many pairs of running shoes do you own? 3 pairs ; indoor running shoes, outdoor running shoes and old running shoes turned walking/everyday shoes. Do you have any superstitions? Not really but I like to make a wish when the clock has all the same numbers. If you had a warning label, what would yours say? Loud giggles may occur without warning. Your ears should be prepared at all time. What is your favorite childhood dish? If you were stranded on a magical (as in, it doesn’t need to be realistic) deserted island, what food would you hope to find there? What is your go-to meal on busy weeknights? What is your favorite dish to bring to potlucks/parties? If the Internet disappeared and you could only rely on one cookbook, which one would it be? What is your favorite food/cooking show? What do you like to eat after a workout? What is your favorite place to look for new recipes? If you could travel to any country for one authentic meal, where would you go? Nominate 11 bloggers who have less than 200 followers. They should be bloggers that you believe deserve some recognition and a little blogging love. Post 11 questions for the bloggers that you nominated to answer. Thank you so much for this award!!! It really means a lot!